Where are you in your company's layoff list? Every company has one, even if it's just a vague idea in the mind of the CEO. By looking around, you should be able to determine approximately where you stand. In my department of 20 people, for example, I believe myself to be #3. Maybe #2, perhaps as low as #5. But one of the first people to go, regardless. Let me stop here, to stress that being laid off does not mean that you're incompetent, or less competent than the people who were retained. Layoffs are a coldly rational response to the prospect of running out of money. Sometimes they happen well in advance of a crisis, sometimes they happen when the company is on the brink of bankruptcy. But in either case, being laid off simply means that the skills you bring to the table are perceived as being less valuable than the associated cost of your salary and benefits. I realize that's not much comfort when you're the person being laid off. I've been laid off three times in a 30+ year career. The first time was six months into my second job, and happened on the Monday that I returned from vacation. I was working for a subsidiary of a midwestern company that made laboratory instruments, an acquisition that had been an independent startup a year or so earlier. For whatever reason, the parent company decided to consolidate operations at their home office. We were all gathered into the large conference room, and told that we no longer had jobs. The third time was similar: I was working for a subsidiary of a subsidiary of a large telecom company that learned too late that flip-phones were passé. There's not much to be learned from these two examples, nor much to be done about them; you simply have to be prepared. If you're lucky, they come with a decent severance package. The left axis is salary: the more expensive you are, the bigger a target you become. You may argue that this doesn't take into account productivity, but I believe that's irrelevant. If you're at a company that values productivity, then everyone will be productive; the idea that there's a 10x difference between top and bottom is a myth. And if you're at a company that doesn't value productivity, you're just a cog in the machine with a known cost, regardless of how productive you think you are (and really, what are you doing at such a company?). The bottom axis, strategic versus tactical, is the one that I think is more interesting. Strategic work is for the future: shaping your next product or next release. Tactical work is about now: operations, bugfixes, responding to immediate customer desires. When a company is forced to choose, they'll value tactics above strategy every time. In the case of my second layoff, I wasn't the highest-paid person but my work was entirely focused on the future; that put me at the top of the list. So what do you do with the knowledge that you're near the top of the layoff list? The facile answer is that you update your resume, but that's wrong on several counts. First, of course, is that your resume should always be up to date, in case the perfect job gets dropped in your lap. Second, if you change jobs you're likely to move from the top of one layoff list to the top of another, without the offsetting benefit of tenure (yeah, it isn't a simple quad-chart; it never is). And finally, because knowing where you are on the list only matters when layoffs are imminent. If you're in a company that's sailing along, with no storms on the horizon, there's little reason to care. Yes, there's always the chance of a black swan event that puts the company in crisis, but those aren't worth sleepless nights. If you work for a company that does have obvious financial difficulties ahead, you should consider your options. 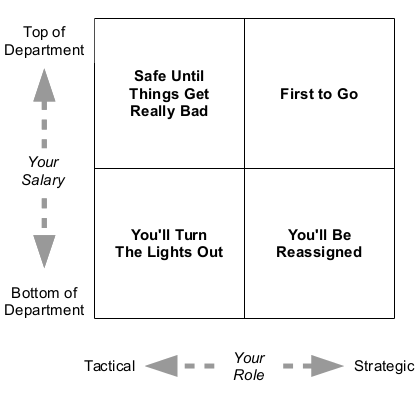 Perhaps you transition from a strategic position to one that's more tactical. Or, again, do nothing. I work for a venture-funded startup, which means that either we become profitable or go out of business. But I'm doing the job that I was hired for, I'm enjoying it, and I'm prepared for the possibility of finding myself without a job. And if you work for a company that has had layoffs and looks like it will have more? Perhaps then it's time for an honest conversation with your manager (or better, your manager's manager). Talk about where you stand on the layoff list, and what steps you can take to either lower your position or ease your departure. In my case, I was already thinking about moving to Philadelphia to be with my now-wife. Perhaps my conversation with our VP raised me to the very top of the list if I wasn't already there. But it meant that both of us were prepared for what happened six months later.